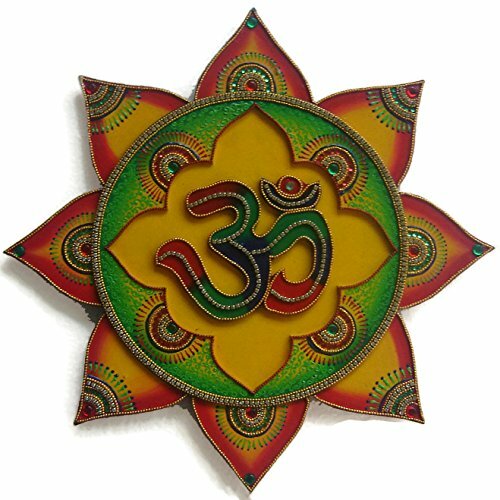 Om symbol or sign represents the beginning of everything in Hindu religion. Based on this philosophy, I have created this wall painting which is ideal for decorating your living room, yoga or meditation room or even office. In this handcrafted painting, I have incorporated three auspicious Hindu symbols together - Om (Aum, as some might say), lotus flower and sun. The wall painting is carved out of environment friendly multi-density fibreboard. After creating basic shapes with acrylic paint, I have decorated the wall hanging with tiny bead chains as well different colour beads and mirror beads. The painting is 13" x 13" from the top end of petal to lower end of petal. There is a hanging hook affixed at the back so you just need a nail on the wall to hang it. I send this painting in a well protected packaging and it delivered by track service. If you have any questions about this product by EthnicAvenue, contact us by completing and submitting the form below. If you are looking for a specif part number, please include it with your message.